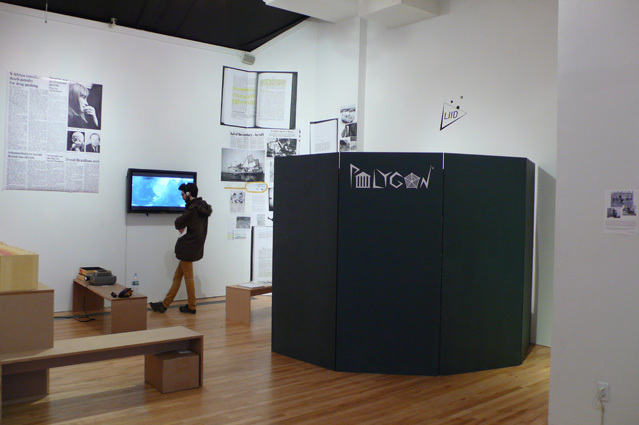 As part of "The Incidental Person (after John Latham)" group-show, curated by Antony Hudek at Apex Art in New York (www.apexart.org), the Polygon work station was installed and used to launch the LIID (www.liid.fr) newly expanded research program. It is the starting point of an ambitious research work-in-progress, in which LIID will invite a handful of "original minds" (artists, scientists, architects, thinkers, entrepreneurs, writers, etc.) from various countries and disciplines to bring their point of view. Experimenting with a multi-faceted "polygonal" research process, in which visions come from different angles and in the shape of a democratic tribune, the Polygon Program aims to find non-conventional solutions to contemporary complex issues. Polygon is a nomadic knowledge production platform operating online (full website undeveloped yet) and during live research sessions with the Polygon station such as at Apex. - Expand creatively around the Polygon figure. January 8th, 2010: Open-call to participate in the collaborative research program on e-artnow. Approximately 20 persons across the world answered. Gallery talk at Apex Art, January 2010. January 15th 2010 : Triangular experiment in the Polygon station by Nicolas Galeazzi, connected through Skype to two other members of his Flutgraben Collective (Berlin), located in Berlin and in Bern. Ghost theater !? - On the same topic, researcher Philippe Durance returns to Descartes' philosophy, illuminating how imagination is, in fact, a deep part of his vision of the human intelligence and reasoning ability. - Annabelle Hagmann reported on the last Venice Architecture Biennale showing how the immaterial aspect of cities is becoming of higher concern in the architecture community, and thus confirming the relevancy of the Urban Conceptual Model Contest. - French art critics Jean-Marc Avrilla shares a discussion with Raphaële Bidault-Waddington about the issue of Art-Based Research in the context of deep academic organization in Europe due to the Bologna agreement. Since the exhibition at Apex, LIID is still under the process of shaping the whole organization of the POLYGON, raising funds, inviting participants, and implementing partnerships with relevant structures in different countries so that the project expands on a global scale. EPISODE #3 : Exhibtion "MENTAL MATTER" at ESPACE D'EN BAS, PARIS. - Gilles Collard, Belgian writer, ex-philosopher, founder of Pylone review. - Pier-Stefano Corasaniti, Italian astrophysician, LUTH (Laboratoire de l'Univers et Théorie), CNRS. - Sylvie Dallet, French historian of creation and of the “art-science" relation, Versailles University. - Philippe Durance, French prospective researcher, LIPSOR (Laboratoire d'Innovation et Prospective des Organisations), CNAM. - Sébastien Grosset, Swiss playwrite under philosophical and musicological influence. - Antony Hudek, Swiss-American curator and art historian, University College London. - Sara Kamalvand, Iranian and Toronto-based architect, founder of Mesopolis Lab. - Hank Kuhne, Dutch expert of Future Centers, founder of EduCore. - Antonio Marazzi, anthropologist, Padova University, Italy. - Alessio Moretti, italian logician and philosopher, Neufchatel University, Switzerland. - Michel Riguidel, French professor in computer science, network and cryptology, Telecom Paris Tech. - Luc Saucier, French creative lawyer in author right and the aesthetic of business. - Eileen Sommerman, Canadian curator in artistic and none artistic contexts. - Richard Shusterman, philosopher in aesthetics, Florida Atlantic University, USA. - Lars Terenius, professor in neurobiology, founder of the Center for Molecular Medicine, Stockholm. - Pacôme Thiellement, French-Egyptian writer, essayist and music critics. is an independent Art-based research laboratory developed by French artist Raphaële Bidault-Waddington since 2000. 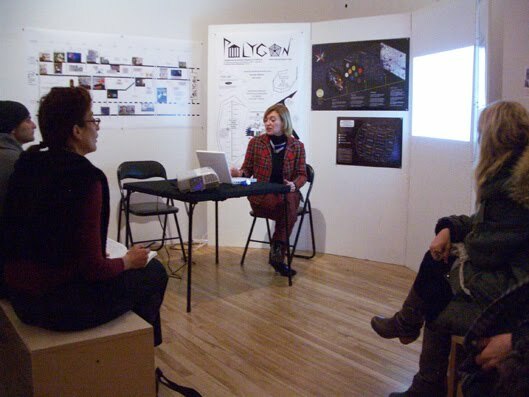 LIID operates at the crossroad of Art, Urban Development, Economy and Knowledge. Topic 1 - Aesthetic Intelligence Swing: investigating the concept of Aesthetic Intelligence. Topic 2 - Urban Conceptual Model Contest: exploring urban conceptual models in the shape of diagrams. Topic 3 - Y Model: Prototyping a Democratic Corporation (vs. an Artistic Corporation). Topic 4 - Republic of Images: prototyping a Green Global Governance. Topic 5 - Polygon Free-Style: free creative exercise around the Polygon figure. January 2010 : Launch at Apex Gallery in New York. April 2011 : Polygon appears in "Matiere Mentale" a soloshow by Raphaele Bidault-Waddington at Espace d'En Bas project space in Paris. 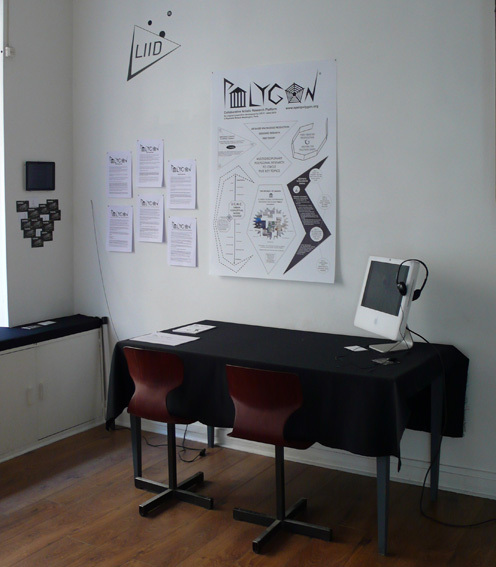 July 2011 : Polygon appears at Aalto University in Helsinki.